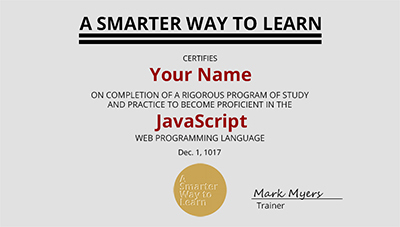 Keep going to earn your certificate. Fill in the blank. Use any text you like. Sorry, the answer is =""
What is the keyword that tells the browser to watch for a click on a link? Drag and drop to create a link that triggers an event. Click in the box and type the next character. I'll autocomplete. Don't type spaces or carriage returns. Using the preferred approach (no #), code a link that triggers an alert that says "Hi" when a link that says "Click" is clicked. To complete the code for this link that triggers an event when it's clicked, fill in the blank. To complete the code for this link that triggers an event when it's clicked, fill in the blank, using the preferred approach (no #). Using the preferred approach (no #), code a link that triggers an event—but stop coding after the second equal sign. Code the rest of this link markup. When the user clicks the link, that says "Click", it displays an alert that says "Hi". Using the preferred approach (no #), write the markup for a link, that says anything you like, that, when clicked, calls a function. The name of the function is also up to you. Time goal: 12 seconds. What is the keyword that tells the browser to watch for a click on a link? Time goal: 40 seconds. When the link is clicked, the function myFunc is called. Fill in the blank. Time goal: 30 seconds. To complete the code for this link that triggers an event when it's clicked, fill in the blank, using the preferred approach (no #). Time goal: 40 seconds. Using the preferred approach (no #), code a link that triggers an event—but stop coding after the second equal sign. Time goal: 60 seconds. Code the rest of this link markup. When the user clicks the link, that says "Are you there? ", it displays an alert that says "Hi". Time goal: 75 seconds. Using the preferred approach (no #), write the markup for a link, that says anything you like, that, when clicked, calls a function. The name of the function is also up to you. Code a link that, when clicked, displays an alert. Code a link that, when clicked, calls the function. Don't change my code. Add your code below it.